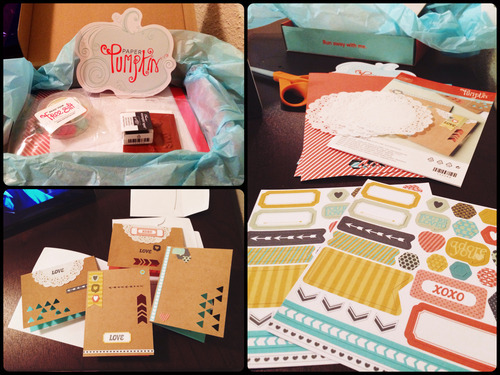 I really tried to hold off doing this month’s Paper Pumpkin project until this weekend… I really did. I mean I just got the box yesterday and I didn’t even get home tonight until 8 p.m. But I couldn’t resist the stickers and paper and stamps and I broke it out while watching West Wing reruns on my iPad. This was a card kit like last time, but there were way more choices in terms of stickers and design. I think that I will need to do this for a while before I find my own style. I felt like I floundered a little bit left to my own devices but I had an enjoyable time, I created these four cards and I know I will get better with practice. And now I have to wait another 29 days or so before my next Paper Pumpkin box gets here.